Yo-yo-yo, after almost a 3 months blog break, im finally back. Why im missing from here for so long? This question have to ask my Mummy, thanks to Baby Jr that growing inside Mummy's stomach and making her feeling unwell. Thus makes her no mood to update my blog. Now, Mummy feeling better and she said she should not hold back any longer about my updates here. But the 1st update here was not a good news at all. Im almost choke to death today at my kindy. How its happened? Puts the blame on the sweet that im eating. I was playing on the slide while chewing on the sweet. As usual, i will keep on jumping and running while waiting for my turn. Then suddenly my teacher realised im not moving and having difficulty in breathing. She quickly come to my aid with 2 other teachers. Thanks to her swift action, i managed to spit out the sweet. I didnt cry at that moment. When Yi-poh comes to fetch me, the moment i step into the car, i start crying. My whole face got this red dot dot. Yi-poh got a shock, she thought i fell down or hurt myself. But then my teacher told her what happened just now. 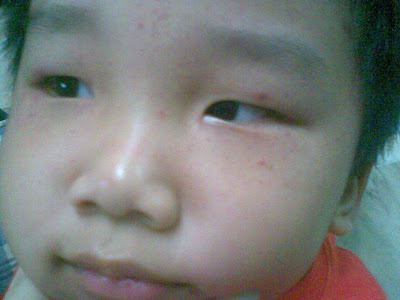 Once reached home, Yi-poh relate the whole incident to Mummy. Mummy got a shock, and quickly call my teacher again. She told the whole thing and keep on apologized to Mummy and sorry for what happened. Mummy didnt blame my teachers, but have to thanks them indeed. Mummy knows how naughty am i, even she and Daddy also cant manage me well. But i do learn the hard side of this incident, i was banned from having sweets and chocs from now on till further notice. Sigh.... that my favourites.. This is how i look like after being 'rescued', and according to Paed, it will takes more than 2 weeks time for the red spot to dissapearred. Wah, scary. After choking will have red spots on the face? Now only I know. Luckily he is safe. Good thing the teachers very pandai! Oh, fell down and hurt again? keke.. Ivy, don't worry, it's very normal for active kids! My Dn also "blue black" everywhere! keke..
aiyoyo...choking ya...kia si lang...teachers always give them sweets? luckily nothing, hope he learn the lesson. aiyoh...choking ah ? very dangerous leh. Luckily, Wyson is fine now. Alamak ! Luckily is safe now.